The role of non-covalent interaction in various physical, chemical, and biochemical processes are well known and, hence, have attracted many researchers towards their nature [1-5]. This has become one of the recent and major interests for computational chemistry to understand and characterize varieties of non-covalent interaction. Among these noncovalent interactions, the hydrogen bond is mostly analyzed due to its critical role in stabilizing various supramolecular framework, in proton transfer reactions, crystal engineering, and others [6-9]. However, recently halogen-substituted (mostly fluorine) molecules have been found to increase the role of other types of interaction and are becoming an expanding area of both experimental and theoretical research [10-13]. While the interaction of benzene with water takes place via the hydrogen atom of water and the π cloud of benzene, the interaction of water with fluorinated benzene takes place via the lone pair of the oxygen atom of water and π cloud of benzene of benzene (Scheme 1). This lone pair-π interaction has recently been verified both theoretically and experimentally . The first experimental proof of the lone pair pair-π interaction was provided by Reedijk and co-workers in 2004 in the complex between Cl– and pyridine . Meyer and co-workers  in the same year reported experimental evidence for the stabilizing interaction between Cl- and triazine igniting further theoretical and experimental investigations in this area. 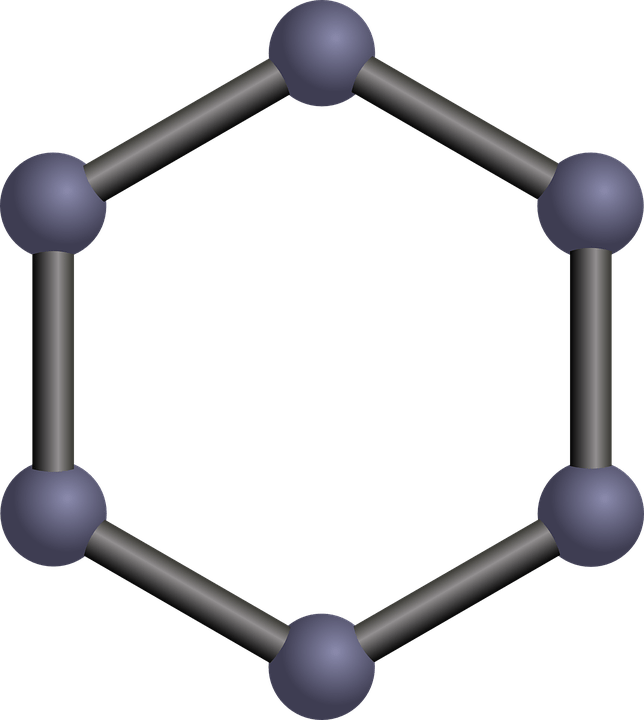 Recently, rotational spectroscopy coupled with theoretical calculations have provided an unambiguous evidence of the lone pair-π hole interaction between the oxygen atom of water and the π cloud of fluorinated benzene (Scheme 1b) [12,16]. The formation of this lone pair-π interaction is facilitated by the inductive effect of fluorine atoms, which withdraws electron density from the benzene ring and creates a “hole” in the region perpendicular to the molecular framework. This region of this hole can attract lone pairs of oxygen atoms and leads to the formation of this lone pair-π interaction. Thus, it seems that this lone pair-π interaction is also competitive with the traditional hydrogen bonds in stabilizing many supramolecular framework. Inspired by this finding, we have undertaken a detailed theoretical study on the structure, energy, and topology of electron density of some selected molecules, as shown in Scheme 2. The molecules considered in this study are benzene (B), hexafluorobenzene (HFB), hexacyanobenzene (HCB), and 1,3,5-trinitrobenzene (TNB), and we considered their interaction with the lone pair as well as hydrogen bond donors such as H2O, NH3, HF and HCl. The interaction of these molecules with benzene takes place via the H atoms of H2O, NH3, HF, HCl and the π cloud of benzene implying that the π cloud of benzene is acting like a heap of electron density which attracts the electropositive H atom of these molecules. On the other hand, the introduction of electron withdrawing substituents such as F, CN, NO2 etc. to benzene makes the aromatic surface electron deficient which then attracts the lone pair region of H2O, NH3, HF, HCl molecules. Thus, the aromatic surface of these substituted benzenes is acting like a heap. Both electrostatic, as well as dispersion, are the dominating contributors to the attractive interaction. The dominance of dispersion interactions points towards the free rotation of H2O, NH3, HF, and HCl molecules, which are also in accordance with the recent experimental observation . These findings are described in the article entitled Non-covalent interaction in benzene and substituted benzene: A theoretical study, recently published in the journal Computational and Theoretical Chemistry. This work was conducted by Chayanika Kashyap, Sabnam S. Ullah, Lakhya J. Mazumder, and Ankur Kanti Guha from Cotton University. Molecular Interactions. From van der Waals to Strongly Bound Complexes. Ed. S. Scheiner, John Wiley & Sons, Chichester, 1997. H –J. Schneider, Angew. Chem. Int. Ed., 48 (2009) 3924-3977. P. Hobza, K. Muller-Dethlefs, Non-Covalent Interactions, Theory and Experiment. Royal Society of Chemistry, Thomas Graham House, Science Park, Milton Road, Cambridge, United Kingdom, 2010. P. Politzer, K. E. Riley, F. A. Bulat, J. S. Murray, Perspectives on halogen bonding and other σ-hole interactions: Lex parsimoniae (Occam’s Razor). Comput. Theor. Chem., 998 (2012) 2-8. S. J. Grabowski, Hydrogen and halogen bonds are ruled by the same mechanisms. Phys. Chem. Chem. Phys. 15 (2013) 7249-7259 and references therein. G.A. Jeffrey, An Introduction to Hydrogen Bonding, Oxford University Press, New York, 1997. S. Scheiner, Hydrogen Bonding, A Theoretical Perspective, Oxford University Press, New York, 1997. M. Nishio, M. Hirota, Y. Umezawa, The CH/π Interaction, Evidence, Nature, and Consequences, Wiley-VCH, New York, 1998. Hydrogen Bonding – New Insights, Ed. S.J. Grabowski, Vol. 3 of the series: Challenges and Advances in Computational Chemistry and Physics, Ed. J. Leszczynski, Springer, 2006. M. Cametti, B. Crousse, P. Metrangolo, R. Milani, G. Resnati, The fluorous effect in biomolecular applications. Chem. Soc. Rev. 41 (2012) 31- 42. R. Berger, G. Resnati, P. Metrangolo, E. Weber, J. Hulliger, Organic fluorine compounds: a great opportunity for enhanced materials properties. Chem. Soc. Rev. 40 (2011) 3496-3508. L. Evangelisti, K. Brendel, H. Mäder, W. Caminati, S. Melandri, Rotational spectroscopy probes water flipping by full fluorination of benzene. Angew. Chem. Int. Ed, 56 (2017) 13699-13703. N. Mohan, C. H. Suresh, A. Kumar, S. Gadre, Molecular electrostatics for probing lone pair–π Interactions. Phys. Chem. Chem. Phys. 15 (2013) 18401-18409 and references therein. P. De Hoog, P. Gamez, I. Mutikainen, U. Turpeinen, J. Reedijk, An Aromatic Anion Receptor: Anion–π Interactions do Exist. Angew. Chem., Int. Ed. 43 (2004) 5815-5817. S. Demeshko, S. Dechert, F. Meyer, Anion−π Interactions in a Carousel Copper(II)−Triazine Complex. J. Am. Chem. Soc., 126 (2004) 4508-4509. A. Bauzá, T. J. Mooibroek, A. Frontera, The Bright Future of Unconventional σ/π-Hole Interactions. ChemPhysChem. 16 (2015) 2496-2517. Ankur is an assistant professor at Cotton University. Previous Post« Previous Is Addictive Behavior Compulsive?